Equipment valued at €580,000 or approximately J$80 million was on Friday (June 24, 2016) handed over to the Mandeville Regional Hospital as part of activities under the Programme for the Reduction of Maternal and Child Mortality (PROMAC). The equipment is for the development of the neonatal High Dependency Unit (HDU) at the hospital. As part of the component on newborn care and emergency obstetric care under PROMAC, eleven HDUs are to be established - five (5) Maternal and six (6) neonatal - in six (6) referral hospitals in Jamaica. They are Mandeville Regional, Victoria Jubilee, Cornwall Regional, Spanish Town and St. Ann’s Bay Hospitals as well as the Bustamante Hospital for Children. Three categories of equipment consisting of thirty (30) different types with a quantity of eighty-one (81) units were handed over to Mandeville Regional Hospital. 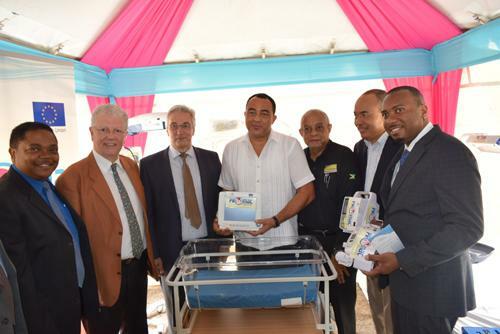 Speaking at the handing over, Minister of Health, Dr. Christopher Tufton said the equipment will facilitate highly specialized radiographic technology, critical care ventilation and specialized patient monitoring. Following the successful conclusion of an International Open Tender, in December 2015, the Planning Institute of Jamaica awarded three (3) supply contracts to an international firm – CEDI Europe based in the Netherlands – to provide this equipment to the Ministry of Health for utilization at the hospital. The specific objectives of PROMAC include reducing the incidence of neonatal and maternal deaths, improving the quality of management of high risk pregnancies at both tertiary and primary care levels and enhancing public awareness and understanding of health care processes and patients’ rights.